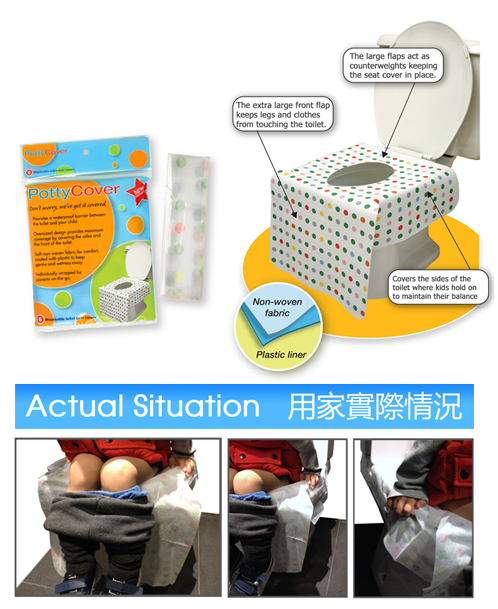 • Provides a waterproof barrier between the toilet and your child. • Oversized design provides maximum coverage by covering the sides and the front of the toilet. • Double layered with soft non-woven fabric on top, coated with a layer of plastic on the bottom to keep germs and wetness away. • Protects children and adults from germs on public toilets. • Ideal for both boys and girls who are old enough to sit on the toilet. • Stays on the toilet without any messy adhesive strips. • Each PottyCover is individually packaged in a small, easy to carry bag. For maximum protection against germs!